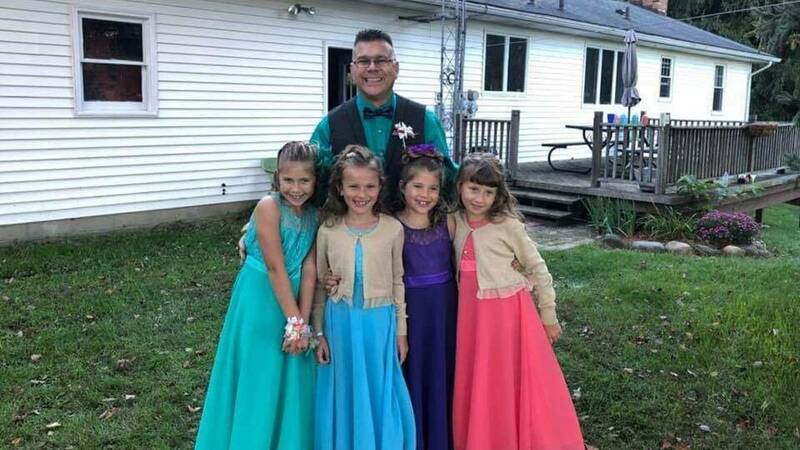 Sisters lost their father in early Sept.
Steve Colbert is a Davison, Michigan, teacher who brought his former students a heartwarming surprise after they recently lost their father and gave them a night sure to remember. (WJRT) - DAVISON, Mich. (WJRT) -- A local teacher went the extra mile and then some for his former students who recently lost their father. Steve Colbert is a Davison teacher who brought them a heartwarming surprise and gave them a night sure to remember. "I tell them you treat each other like family and I tell them never to miss an opportunity,” he said. Colbert didn't want Avery and Olivia Reece to miss out on a special moment to any young girl’s life -- the Daddy-Daughter Dance. In early September, Olivia and Avery's dad Luke's health problems began. Colbert had already made plans to invite the girls to join his family at the dance. The day he planned to ask them to go, Luke's condition took a turn for the worse. Luke died on Sept. 19 and the dance was scheduled for Oct. 13. Colbert still wanted to make sure his two former students were able to go to their dance. "I told them, 'OK, I am not driving tonight, so one of you is going to work the pedals and one of you is going to work the steering wheel. Somebody could honk the horn and somebody can scream out directions,'" Colbert said. He purposely was giving them wrong directions to hide a big surprise. “We rented a limo. I had friends step up to buy their dresses. Another friend stepped up and bought the corsages and my boutonniere and even my own daughter's corsages,” Colbert said. "It felt like as if I was a Barbie Doll,” Avery Reece said. All of them had fun at the dance, although the girls joked that Colbert needs to work on his skills on the dance floor. All of four of them had balloons with Luke's name on it saying #BeLikeLuke. "They are important to me just like my own family is and I want them to trust me, and I want them to believe in me the same way I believe in them and trust them,” Colbert said. Luke was an organ donor and has been able to help 65 people.